Our mission is to create a lifetime customer by providing flexible, competitive, responsible & timely transportation at all times. Here at Suppose U Drive, we put two things before anything else: customer satisfaction and customer safety. For us, these two things should be the priorities for businesses of all sizes, and we hold ourselves to strict standards when it comes to upholding these two important aspects of serving our community. In our opinion, this is why we’ve been successfully and proudly serving the region for more than 80 years. Through our reliable equipment, high-quality work, and professional staff, we are able to offer best-in-class services while still maintaining the flexibility and personal service of being a local, family-owned business. Suppose U Drive was founded by Edwin E. Johnston & his wife Mildred in 1936. Today, owned and managed by the 2nd and 3rd generations of Johnstons, we are 3 locations strong providing commercial, studio, and residential trucks throughout Southern California. We are proud to be a local, family-owned company. Over the years, we have expanded to multiple locations and brought on many new employees, but we will always uphold the highest standards when it comes to being a supportive business for our community. As we continue to expand our company, taking on new staff is a vital part of the future success of Suppose U Drive. But, it’s a decision not made lightly. You can learn more about a potential career with Suppose U Drive by reading about our open positions, and what we expect from our team members. Do you need to add to your fleet? 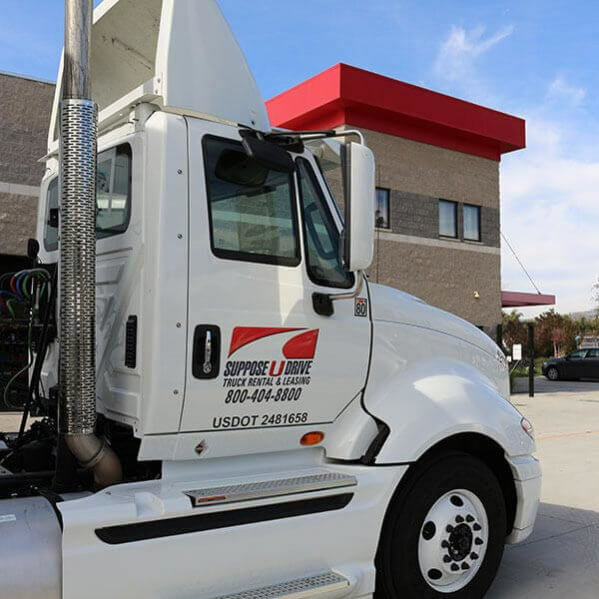 In an effort to always offer the best, most reliable equipment to our clients, we are consistently creating customized and competitive leasing programs for fleets all across Southern California. We have the most diverse fleet of trucks in Southern California that are maintained to the highest standards, with service warranties to ensure their reliability. Learn more. Are you looking for a short-term truck rental? Suppose U Drive writes rental agreements by the day, week, month or year. Our rental fleet is a balanced mix of late model vans, stake bodies, box trucks of all sizes, and tractor-trailer combinations of all weight classes. Rental trucks are fully maintained and can be picked up and dropped off at 2 locations. Describe your transportation need and Suppose U Drive will recommend the unit best suited to fulfill it. Learn more. Do you want to lower your operating costs?